The season of good cheer is upon us, and while we prepare to celebrate with our family and friends, we can’t forget the furry guests at the party. Whether you’re lighting the Hanukkah candles or gathering around the Christmas tree, it's extra important to keep an eye on the pets in the household during the holidays. Here are some tips to ensure they stay safe and happy during the holiday season. 1. Give them a space to be alone. Your home can get busy around the holidays, with family and friends stopping by to exchange gifts and food, so it's important to be aware that an influx of people can cause stress for your pets. The new people are just one of many changes to your pet's environment — they also have to deal with holiday decorations or a big Christmas tree in their living space. Whether they're generally sociable or not, pets can become overexcited or anxious with an endless stream of visitors. Consider giving them a safe place in the house where they can get away from all the strangers. A bedroom in the back of the house where guests can't enter, or even the garage if you live someplace warm, make great escape zones. Or, if you have cat, a cardboard box might do the trick. 2. Keep decorations out of their reach. 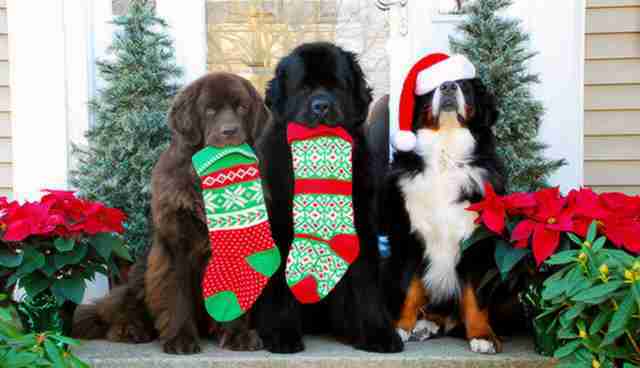 Holiday decorations can cause a wide variety of dangerous situations for your pets. Aside from the extra lights potentially adding stress, the bulbs are made of glass that can break in your dog's or cat's mouth if chewed on. The wires can put a chew-happy dog in danger of electrocution, and ornaments, batted off the tree by your cat, can cut your pet’s feet if broken. Opt for plastic bulbs instead of glass, and place breakable decorations toward the top of the tree (or on a smaller tree out of your pet’s reach). Many ornaments are also small enough to be choking hazards and cause internal damage to the intestine if swallowed — same with tinsel! That's why it's important to keep decorations out of reach. Remember to always keep an eye on pets when they're loose around your Christmas displays. 3. Keep their paws off the table. If there's one thing that's more abundant than presents during the holidays, it's food. Rest assured that your pets have noticed this too — and they want in on the action. No matter how convincing their puppy dog eyes are, keep table scraps where they belong: on the table. There are a lot of human foods that are just not good for animals. While many pet owners are already aware that chocolate can wreak serious havoc on a dog’s digestive tract, candies, cookies or other processed treats are also bad, as well as the fatty trimmings from the holiday feast. Eggnog, cake, grapes and onions are also big no-nos. We know it's difficult, but you should try your best to keep your pet strictly on his normal diet. If you want to indulge him, give him a treat — one that's made especially for animals. 4. Don't let pets drink from the tree. Cats are notorious for climbing Christmas trees, but the appeal of that big, sparkly thing in the corner doesn't end there. They may also try to drink the water in the tree's stand — water that can be toxic. If the water sits stagnant for a long period of time, it can quickly become infested with bacteria, which can cause your pet to become seriously ill. Be sure to cover the tree stand during the day so it doesn't tempt them. 5. Quickly dispose of wrapping paper. It might be cute to watch your furry friend roll around in the aftereffects of Christmas morning gift exchanges, but be sure he doesn't ingest any of it. Wrapping paper and ribbons pose a choking hazard, and can cause serious damage to a dog's insides. If you notice that your dog is having symptoms such as difficulty going to the bathroom, vomiting, stomach pain or lethargy, set up an appointment with your vet to make sure you pup hasn’t eaten anything he shouldn’t have. And remember, it's best to throw out paper as soon as possible and fill Fido’s stocking with toys to keep him occupied instead.